SEATTLE, Wash. -- Unlawful actions and misconduct by rogue police officers are creating a serious negative image for law enforcement and a significant and unbudgeted financial expense for the governments they serve. For years, police who protect and serve were held in the highest regard by the public. However, because of social media and the Internet a negative story about police misconduct today instantly becomes national news across the country and throughout the world. The misdeeds of a few can become a catalyst for disruptive and even violent protests and demonstrations. Every city, county, state and federal law enforcement agency is vulnerable to a crisis. These crises are exacerbated when those in charge fail to promptly and properly communicate to the media and public. He believes it is important to understand the philosophy of Saul Alinsky, a proponent of non-violent disruption, in order to anticipate, be prepared and manage protests and demonstrations. “Alinsky’s writings are a step-by-step how to for protesters,” he says. 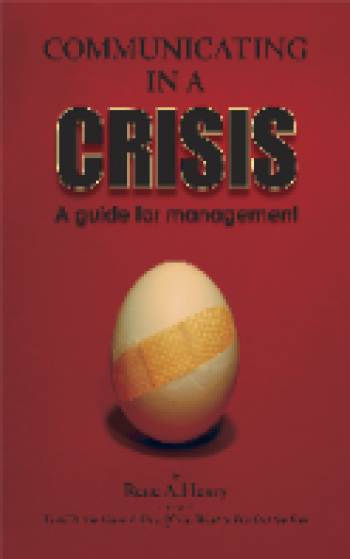 Scores of anecdotes and case histories from actual crises highlight his recommended dos and don’ts for the reader. His book also outlines working relationships between lawyers and public relations counselors before and during crises. In addition to police misconduct, Henry cites five generic crises: terrorism; acts of Mother Nature including earthquakes, hurricanes, floods and tornados; sexual harassment and discrimination; violence in the workplace; and environmental pollution. A chapter on customer service stresses its importance in helping prevent crises. “Trust, credibility and goodwill must be banked in advance and there must be transparency to have public support,” he says. Another chapter tells the reader how to fight back and win in situations when officers and a department have been wronged or maligned.